What is the purpose of suspended mechanical scales? 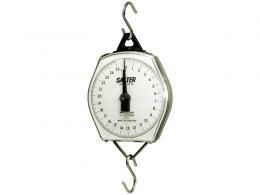 Suspended mechanical scales are used to measure the weight of an object. Traditional mechanical scales use a spring-based system to calculate how far a spring changes from its original position after it is holding the weight of an object. The object that is to be weighed is generally secured to the mechanical scale using a hook. Based on the amount that the spring is altered after the object is attached to the hook, the scale is able to determine the total weight. This is possible as the scale is equipped with a mechanism that allows it to transfer the amount of alteration within the spring to a dial. This dial has numbers that correspond to various measurements. The final location, determined by a hand on the dial, gives the accurate measurement of the object being weighed. 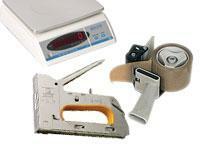 Mechanical scales are popular in many different industries. They can be used to weigh any number of products of varying weights. 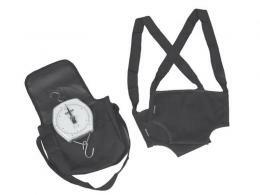 This product may be used in home garages for those who have reason to measure multiple objects. It is probably best suited, however, for those who work in industries where measuring objects is a large part of the job description. This manual scale will give an accurate reading in a matter of seconds to ensure that plenty of time is left for the individual to move on to other tasks that need to be completed. As an added bonus, the individual who uses this manual scale will never have to worry about changing batteries or fiddling with LED screen display options. The ease and reliability of this product makes it a great tool to have on hand regardless of which industry or field an individual is employed in.